Pictured below is our latest low voltage disconnect circuit with LCD display. As with our standard programmable low voltage disconnect (LVD), this device is designed to protect batteries from being discharged too deeply and permanently damaged. The user can set the low voltage at which the output loads will automatically be switched off, and also the higher cancellation voltage above which the output loads will be switched back on again. This particular LVD has a backlit LCD on which system information is constantly displayed. It is also used when setting the low and high voltage thresholds which makes things a lot clearer and simpler than using LEDs or a rotary switch to programme those in. As shown above the display shows the measured battery voltage updated multiple times per second and given to 2 decimal places of resolution (and calibrated to be accurate to within +/- 0.02 Volts across the range 10-16V). The system status is usually ON or OFF, but can also be LOW or HIGH when the battery voltage is transitioning one of the thresholds about to change the state of the system. 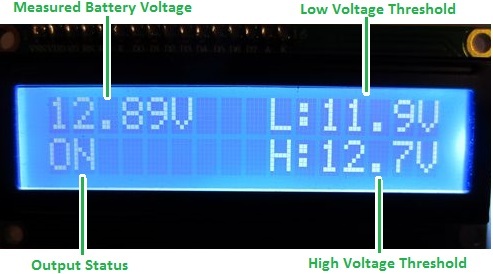 The high and low threshold voltages are also permanently displayed. In order to avoid the output cycling on and off too often (particuarly as the battery voltages can spike or dip depending on the loads they are powering) there is a time delay during which the voltage must remain under/over the voltage threshold before the system will change from ON to OFF or OFF to ON respectively. During that time delay the backlight of the display flashes as a visual indicator that the threshold has been breached. We chose to flash the display itself rather than flashing an LED either on the board or on leads, since it is much easier to panel mount just the LCD than to mount both that and an LED indicator. This particular client-tailored LVD has a MOSFET directly switching the output loads which can have a maximum total rating of 3 Amps. We can also make this with a relay fitted on board for direct switching, or a lower rated output which can be used to energise a high current (or high voltage) rated relay external to the board – e.g. an automotive relay or a solid state relay (SSR). This low voltage voltage disconnect with LCD is now available direct from the REUK Shop. Click here to find out more or to purchase now: buy REUK Low Voltage Disconnect with LCD. 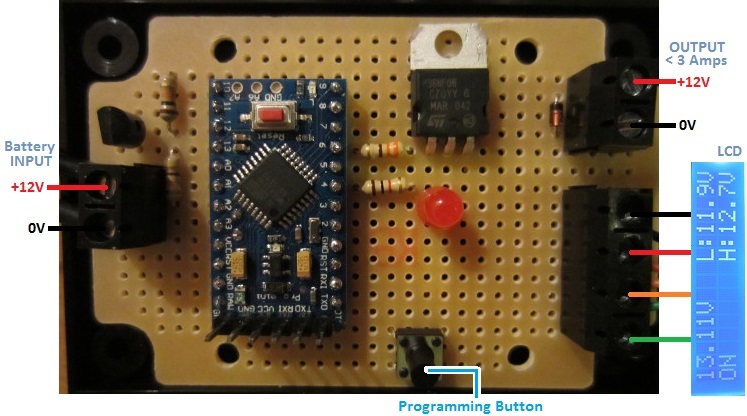 We will shortly be adding a very similar unit with the addition of datalogging functionality. Over the last couple of years we have sold many LVDs with built in dataloggers (see here for an example: Low Voltage Disconnect with Display and Datalogger), and we now have refined things to the point that the product is ready for general sale. In the meantime, if you have any requirement for a low voltage disconnect with or without a display and with or without datalogging, please email neil@reuk.co.uk with details of your requirements.